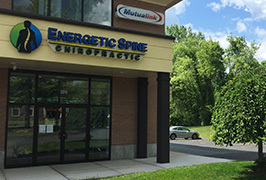 Everybody in Wallingford, Meriden and the surrounding area can benefit from maintaining a healthy spine and nervous system through care from their chiropractor. Regular Chiropractic adjustments help to decrease pain, improve your athletic performance, keep you healthier, and enhance your overall quality of life. Chiropractic care can help all of us because the nervous system controls and regulates all functions in the body. Since chiropractic care improves the functioning of the nervous system, it has the potential to improve all aspects of health. Source: “Chiropractors as Primary Care Providers Update to 2004 study shows continued low utilization costs and high patient satisfaction rates,” by Meghan Vivo, Associate Editor, Dynamic Chiropractic, Vol. 25, Issue 12, June 4, 2007 . Office Hours Mon: 9:30 a.m. - 1 p.m. | 3 p.m. - 6 p.m.
Tues: 9:30 a.m. - 1 p.m. | 3 p.m. - 6 p.m. Wed: 3 p.m. - 6 p.m.
Thurs: 9:30 a.m. - 1 p.m. | 3 p.m. - 6 p.m. Right on the Meriden/Wallingford Townline. We proudly serve Central Connecticut!